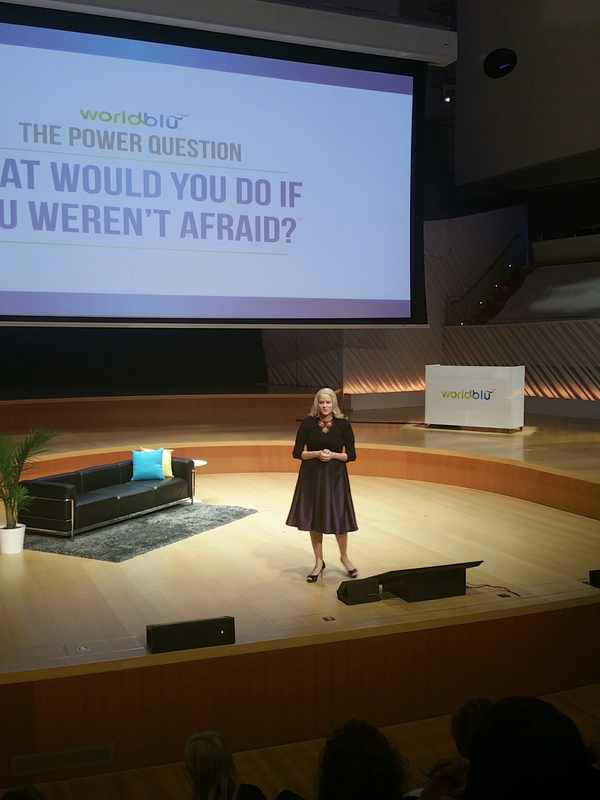 It’s Day 2 of the WorldBlu Power Question Summit in Miami and a day full of insight and conversational flow. And it’s flow that I’m feeling. 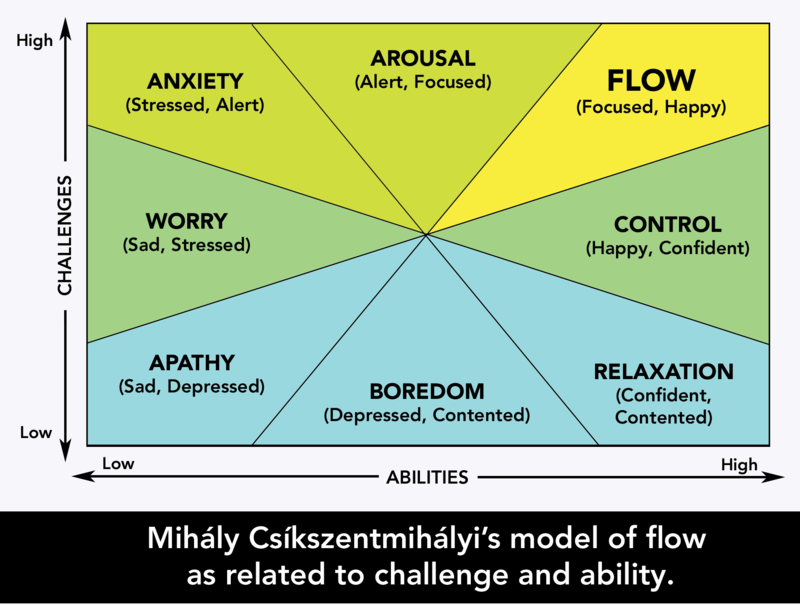 Flow as in Mihaly Csikszentmihalyi variety. The right amount of skill and pressure to gain the state of optimum performance and application to something we want or need to do. It was this state that kept popping into my head as we addressed fear. Fear that we might fail. That we are ill equipped. That we are not allowed. That we are facing adversity we cannot contain or control. Fear that others will think we’re out of our minds thinking it doing something. Fear we don’t believe in ourselves. Fear we’ll compromise our values. Many types of fear we face in our lives and ways of working. 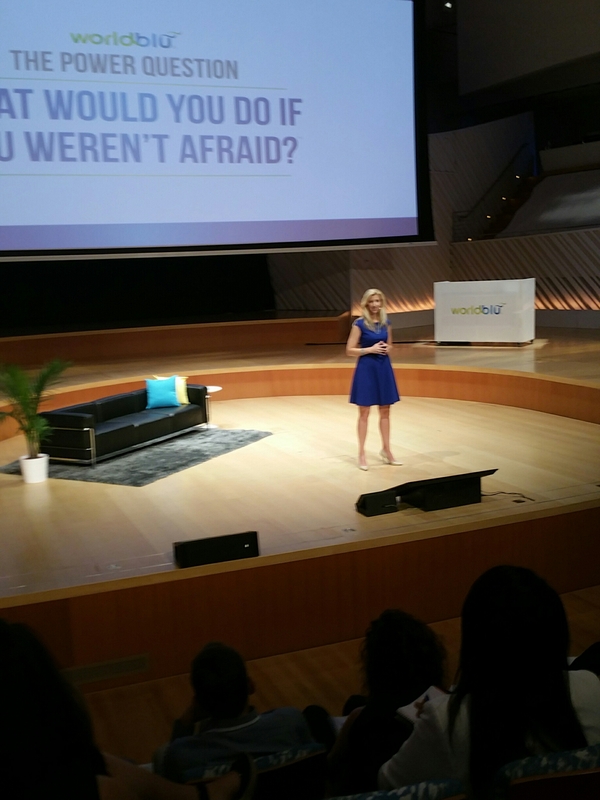 With the scene set by Traci Fenton CEO of WorldBlu, we worked through some exercises that defined fear for us and gave a frame to the fears we have. Henri Hyppönen kicked us off with his research into fear. Fear that makes us less socially connected. Fear that makes our IQ drop. Fear that means we resist change. 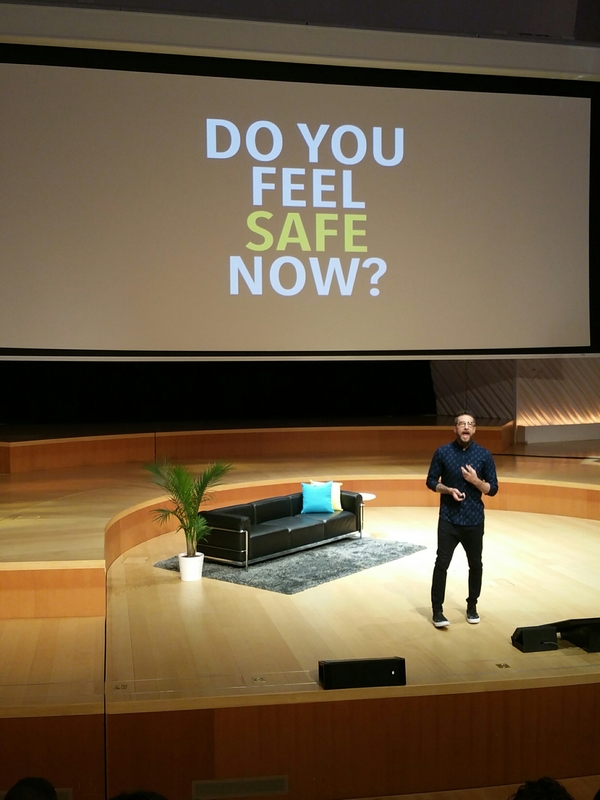 And most importantly for – the plus point of the day for me – keep the fear outward facing in an organisation and create safety within it. Henri stated there is a problem with a burning platform of fear to change: people may get burned on it. Kirsty Spraggon is a sharp minded Aussie who has previously been a high performer in real estate sales. And then she confronted a fear live on a TEDx stage in Malibu. Something that held her back for years. From that point on Kirsty provided inspiration to others to face similar fears and the story of one woman’s outing of a fear brought all to tears. Kirsty left us with a great thought : if you bury the fear you also bury much potential joy in your life. And an A-Emotional hum to your life does you no good at all. We heard of the fear of slowing down and of slow generally. Carl Honore has faced his fear of slow and built slow, calm, in the moment to his life and he’s better in a dimensions. The stigma attached to slow is a societal pressure that is leading to over or peak work, low attention spans and snatched living. We heard of the use of the Power Question to bring clarity to bear in both leading and change by Ed Wesley, Garry Ridge and Nathan Donaldson. We heard of authentic push backs on bullying behaviour from Miranda Ash. Overcoming a fear of loss and discovery of a place of power despite the loss. And we plotted our own fears and made sense of an inventory of fears. We worked through a fear in details and shared it with our thought partner. And then we built our story through Travis Thomas and Mat Matheson’s improv techniques. Something you fear and realise you need some work doing to? Let it out of your head and invite others in. People care about what your fears are. People want to help others through things that they fear. You are in optimum performance state when you have high skill and high pressure. For high skill read tactics, definition and determined energy. For skills you might not have, others may have to lend to your cause. For high pressure read a situation of fear. Of significance. Of challenge. Then you have freedom to flow. Creating a state of flow from a state of fear is likely to lead to resolution strategies, confident application and belief. Freedom to believe in your state of flow to overcome fear and create action. WorldBlu Freedom at Work Summit 2016 (aka The Power Question summit) is underway here in Miami, FL. Yesterday afternoon (May 9th) I had the absolute honour of co-facilitating an Open Space session with John Engle (CEO of Haiti Partners) and over 40 participants at this year’s event. Expertly positioned by John, the participants formed the biggest circle possible in our Open Space. One by one we did what used to be known as the “creeping death introductions session”; yet this was no cringeworthy exercise: This was where each participant revealed a piece of themselves in their pursuit and belief in freedom-centred working. My contribution with John was to create the space and share the principles of the Open Space method and let the participants drive their contribution to the event and what was on their minds and in their hearts. I positioned the question “How do you create a freedom-centred workplace?” yet I invited something much bigger, bolder and more personally powerful to those participants: today we could change the world we live in for better work and working lives for those around us and those coming on after us. We had the chance to feel the power within us and ask the questions that mattered to us and the world we work in to truly make a difference. I felt a surge of emotion as I talked through my belief in the people in that room. From Zappos to sole practitioners; from Nearsoft and Widen to Red Bubble and GE; from Haiti to Copenhagen; from New York to Cedar Rapids. From first timers to veterans of the WorldBlu summit. We ALL had something to bring, share and create. We heard from growing democratic workplaces keen to see that growth continue but feeling the tension of challenge to the model that’s made the success possible. We heard that leadership in a democratic organisation is vital and that decentralisation is as critical. We heard about the rise of work-related stress and consideration that a democratic, freedom-centred way could be a way out of this “epidemic”. We heard from people keen to start their journey and others wanting to build a firmer epicentre of trust to what they already had. We heard about more fun in the workplace and the need for more diversity in that open, democratic workplace we already value. We heard that innovation, disruption and a sense of restlessness was a worthy consideration in working towards a freedom-centred vision. And we heard that we can all spread the word of democracy at work and invite the world to be more participative in something meaningful for all. Most of what I heard was a power in each and every participant and therefore in each and every one of us. We rarely gift ourselves with the realisation that power is in us. We see power in others, in social and legal constructs, in collective affiliations and in politicians and companies. We all have power. All of us in the room yesterday afternoon are now part of something bigger than themselves and potentially bigger than we realised we were. We have something to do. We have others with us in spirit, in mind and in soul. We have asked of ourselves and we’ve invited and shared with others. We have given ourselves the gift – even if momentarily – of power. When we think of our power we may shy away from our potential or be just a little apprehensive about our impact on the world. My hope is that we now think differently about the power in ourselves. That we create a fusion of energy, belief and actions that helps realise the reason we were drawn to that room yesterday afternoon. For in ourselves lies the true greatness we deserve to unleash on the world. Individually we may seem a mere atom in the cosmos yet connected to others as we did yesterday, we are the universe. #WorldBluBritPack Blog 2 – The Power in Leading through Freedom. A leader that gets people up, tuned in, energised and applied towards something meaningful and useful is critical. I’ve seen leaders hold a place together because at one level there are leaders with toxicity and greed, power-lust and ambition and that’s been countered by other leaders being human, smart, caring and responsive to people’s needs. The best examples we’re seeing in the world of leadership are when the human and the dignified ambition combine to urge people onto great things collectively. THAT’S great leading in my view. thrives and gives rise to meaningful activities, fulfilling lives and joy in accomplishment. A place where there is freedom. Freedom to express yourself – who are you not just what do you do. Freedom to be creative – show us what you think the world could be like. Freedom to be collaborative – let others around you join in with the brilliance you want to be part of. Freedom to be vulnerable – when things aren’t as they should be, there should be protection, preservation and perseverance. Freedom to learn – let yourself go wild and find the things that make you a better human, a better part of something. Freedom to celebrate – when your excitement at accomplishment is unstoppable and you want to let that joy out. When you think about you as a leader what do you TRULY believe others will say about you? Will they say they have freedom to express, be creative, collaborative, vulnerable, to learn and to celebrate? Or some or even one of these? Because if they aren’t honestly able to attest to all 6 of these, then you my friend, have work to do. This is not an all-knowing click-bait “6 things leaders need to do more of”. It is though a plea from the soul of everyone who needs you to lead purely, clearly and with freedom in your heart. And if you have fear, let the fear be known and be worked on together and not used as a springboard to power, push, assertion, direction and panic. So leaders, what WOULD you do if you weren’t afraid? Would you let people have the freedom to be, in the work they do with you? Or will you control and be the thing other leaders think you ought to be? Being yourself without fear holding you back, could open up something new, special and powerful in all the right ways. So what WOULD you do if you weren’t afraid..? #WorldBluBritPack Blog 1 – The Power in Freedom. There’s something in the air. Frederic Laloux used this phrase and it was based on his much talked-about work featuring in the book “Reinventing Organisations”. Teal organisations – whether you like the phrase or loathe it – is about a shift. A shift in the way we – as endeavouring Human Beings are approaching and want to feel enabled by our work. I don’t even like calling this sort of thing a job anymore. The “job” proposition has such a controlled, locked in and owned feel to it. My good friend Simon Heath has an even stronger view than mine saying “human endeavour is what gets the hairs on the back of your neck stand up. Work is a damp fart”. I get that I really do. We should LOVE what we do. Even if it feels a bit choresome – take pride and feel the sense of worth, value and accomplishment in what we do. Our machine and commoditised existence means we have created low value jobs for people who don’t really want to do the work but need the money and that’s given rise to growing distrust in people. That we have so much management and controlling policies is because we believe we cannot rely on ethics, principles or belief in each other. I know the receptors in my brain light up when I’m given work to do that I KNOW will have a positive impact on others. Whether that is actually fixing something or creating something new that delivers something better or more fulfilling than before. I’m lucky and focused on who I’ve found to work with and believe in, and what I’ve found as the things that I NEED to work on. #FreedomatWork is one of those. Which is why I’m delighted to be headed to Miami to join the WorldBlu collective. Even more than joining in I’ll be holding the space on a session on Monday as the soft start of a 3 day summit around the principles of democracy at work and the pursuit of freedom centred working and leading. That we even NEED a summit like this is a shame. Because in many respects and for a long time, we’ve dehumanised work and we’re about to see more work going the way of machines, technology and automated devices. I won’t go down this route because this is a post derived from my belief in the human spirit and in the sense of purpose. Back to there’s something in the air. There is. I don’t believe I’m alone in this but I know there are millions of doubters and deniers, decryers and denouncers. Yet I can feel a gentle surge of humanism set against a forceful clinging of power by the incumbents. If there’s one thing I truly believe in it’s that overuse of power means it eventually destroys itself; and that hope, belief, compassion and generosity prevail. It’s cyclical. Dark needs light and good needs bad. Yet the rhythm and the impact of both need to provide sustainable ways. When we face adversity, we group and work together or we turn on each other and fragment When there is no adversity, we create it and do the same. It’s the rhythm of life, the force of nature whatever you want to call it. Yet controlism has had it’s time in the light and now is – in my view – ready for the dark to allow freedom to come back into the light. If you look at the world you’d think “sure there’s some developing nations but surely we’re more prosperous than ever (despite the odd 4-year crisis every 10 years). We’re getting to live longer and diseases aren’t wiping us out like before.” That may be the case in some places but drug addiction, crime, domestic violence, fraud,radicalism etc exists and creates disharmony and a challenge to living without fear. 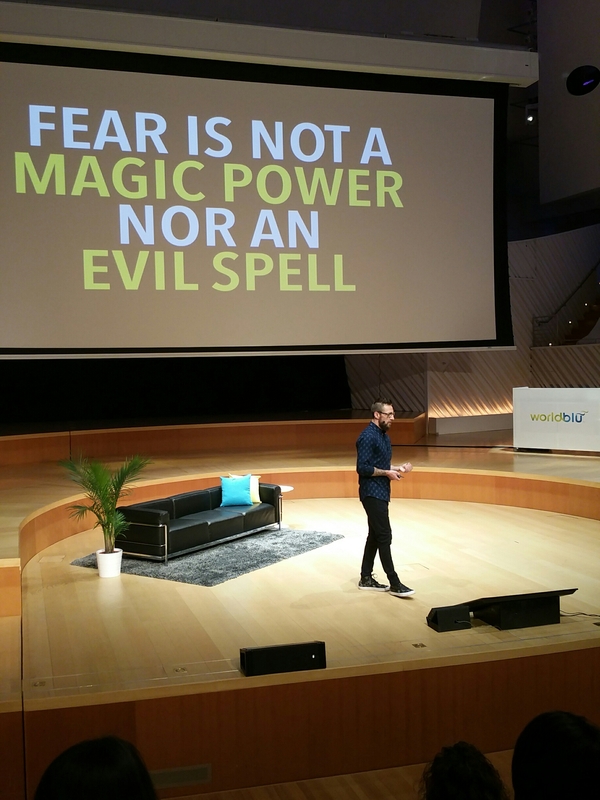 If we don’t live without fear how can we possibly expect to work without fear? Controlism causes the creation of new forms of anti-controlism. Wealth creation but inequality brings discord and uprising. Brutal regimes force people to fight back and overthrow them. So the more we try and control people at work through systems, financial frameworks, managing, contractual and litigious ways the more people will feel the discord, fight back or withdraw and fight or flee from harm. Controlism. That’s what we need to be rebelling against by diverting our energies to whatever brings more freedom. I see people light up when given the freedom they need and deserve yet even a tiny hint of suspicion and a feeling “can this be real?”. SO used to controlism are we that are unsure when we are given freedom either because we’re conditioned to accept and work with controlism or that we feel no longer competent without controlling methods. Freedom. It is such a big and beautiful word. Just the sense of it lifts my soul when I utter the words “I want to be free”. When I hear people say “I felt so free…” I have the most empathic reaction and feel enriched by one simple word. Freedom. If you believe in yourself and in making a way through life that matter to YOU, then freedom is important. Freedom to work how you want. Freedom to live with who you want. Freedom to choose the way to live that creates good for others (be it financial or otherwise). Freedom to create choices that do good. Freedom to create more freedom for others. There will be more from The Power Question Summit this week from me as part of the #WorldBluBritPack.